I could have sworn I saw and bookmarked a tutorial for embellished dishtowels with snaps but when I went to look for it I couldn't find it anywhere-- perhaps I dreamt it?. If you have seen that tutorial (and know where to find it) don't be shy, let me know in the comments. After many months the original tutorial has been found!! I knew I hadn't dreamt it. It is by Jess of craftiness is not optional. Thanks for the inspiration Jess! Cut a piece of pre-washed fabric about 1/2-1 inch larger than the width of the pre-washed towel and your desired height (mine was about 5" tall). Fold and iron the long edges and the short edges. Pin it on top of the towel making sure the width fits to the edges on both sides, adjust your folded edges if needed. Sew all the way around your fabric rectangle being sure to back stitch when you start and stop. 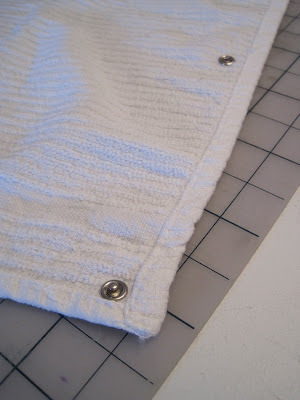 Following the package directions attach your snap fasteners (not sew on snaps) to your towel. Two stud snaps just inside the seam in each top corner and two socket snaps about 7.5" straight down from the top snaps. Snap it on to your stove handle and you're done! My dish towels are forever falling on the floor... or being pulled off the handle by little hands... or used and then tossed onto the counter far away from the sink... can you tell that I hate loosing my towels? I love that this one stays in place. Plus it looks pretty. I need to make lots more. This is perfect. I have the same problem. Mine usually end up in Lucy's doll bed as a blanket. What a great idea! I am thinking I should do this in our bathrooms as well. Those hand towels are forever being picked up off the floor. Thanks for all the great ideas. I've been reading for awhile but don't think I have ever commented. clever, indeed! I'm a little obsessive compulsive about my towels, and really anything fabric, on the floor. What a great idea! I have never seen snaps on dishtowels before. I love yours. And love the fabric. So cute! How cute! I love it! What great idea to add snaps, my sons favorite thing is to steal the towel from the stove! You're so clever miss Erin! I love it! i love that it has snaps on it - it's going on "the list" for sure! I have the same problem. What a great idea! Thanks for sharing. Great project. I love it! Love it! My kids are always pulling my towels off. Thanks for all your other ideas as well. I've never commented before, but I enjoy reading about your project ideas. Great idea! My son's always pulling the towels down and runing around the house with them trailing behind him. I'm giving this a try next week as soon as my sewing machine's home from the repair shop! fabulous idea! 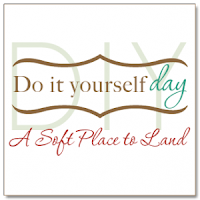 thanks for posting- i found your blog just a few weeks ago and love it. cute AND practical. I love it! Well aren't you just too cute! I love this! I have had this idea floating around in my head. (The towel embellishment, not the snaps.) But I had yet to implement it. But I love this! Thanks for showing me how to do it and inspiring me again! I finally have something to do with all of my fabric scraps! The snaps are such a great idea! My towels are always being pulled down by Penelope, I'll have to try this out. I have not seen a tutorial about it, yours is too cute. Here's a great giveaway. Nothing to do but comment. Neato idea! The fabric is pretty!Love your blog....fresh!!!!!!!! I love this, and the snap is a great idea. You did a great job,thanks for sharing. What a grand idea!! Necessity is the mother of invention!! I love the snaps idea! Mine are also always falling off. That fabric is gorgeous too. treyandlucy.blogspot.com has a tutorial on dishtowels hung with a pot holder. Both great ideas! Erin the snaps are a brilliant idea, i use safety pins,I know tacky..going to put snaps on mine as soon as I find my sewing stuff (we moved here in June, still a mess). I am also going to try my hand at embellishing towels, what a great idea for gifts.. 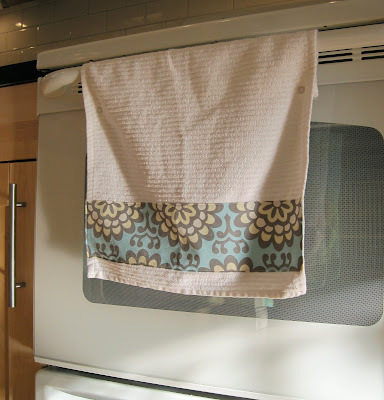 Such a great idea, teenagers throw dish towels around the kitchen too! :) Thanks for sharing. It's such a fun way to spruce up your towels and change them from season to season! I love your blog, by the way! This is such a fantastic idea! I could totally use a bunch of these. I'll be linking to this! Anybody have any ideas on where to get nice but cheap white towels for this project?? I want to make some for Christmas gifts but don't want it to get too pricey! @golden04- i bought my terry cloth towels (that I used for the tutorial) at walmart. but a few months ago i bought flour sack towels on amazon.com. i love them so much more than terry cloth. the flour sack towels are extra large. the are also very light weight but absorb better than terry cloth. hope that helps! If you have a question make sure you have an email address linked up to your blogger account or leave your email address in the comment so I can respond otherwise I will answer your question here in the comments section. I love making things, especially when it comes from something that would otherwise be thrown out. I'm inspired by so many creative people out there and hope I am able to do the same for you. Enjoy. grab your own sutton button! NO MORE EMPTY BABY HOUSE!!!!! © All personal images are copyrighted by me unless otherwise credited. You are very welcome to link to this blog.